"Square crimson panel, on which face sheet on perimeter the framework (width 1/10 gonfalone's sizes) with embroidered gold ornament as the stylized branches of a guelder-rose with gold border. In the corners of a framework are the images of the cossack's crosses embroidered by gold. 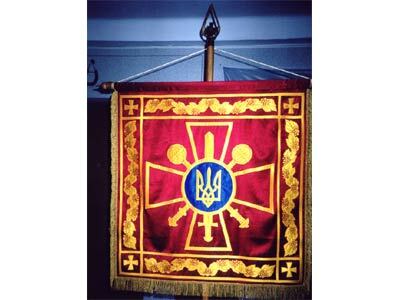 In the centre of a panel is the emblem of the Ministry of Defence of Ukraine - a symbol Ukrainian Army, imposed on crossed gold mace (scope of a cross is equal 4/5 width of a panel). The gold sword is imposed on a cross on a vertical by an edge upwards. On the edges gonfalone embroidered by a gold fringe. Both sides of a panel are identical. The size is 90X90 cm. Gonfalone is handed to the Minister of Defence of Ukraine, general of army of Ukraine O.Shkidchenko at December, 5, 2001 on the 10-th anniversary of the Ukrainain Army celebration." 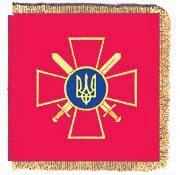 The Ministry of Defence flag was established by Decree No. 705 of September 3, 2009. The Minister's Standard is actually a gonfalon, as seen here, also established by this same Decree, Decree No. 705 of September 3, 2009. 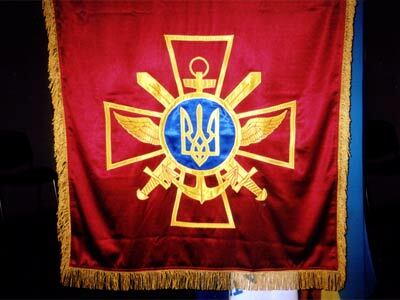 This flag of the Ministry of Defence and the minister's standard are based on those. "Gonfalone of the chief of the Headquarter - the first deputy minister of defense of Ukraine. Square crimson panel with the emblem of Headquarter in the center. 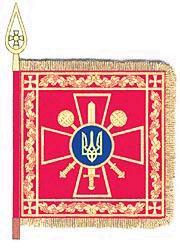 There is Ukrainian Army symbol which placed on the gold crossed swords edges upwards. The gold stylized wings and an anchor are imposed on a cross. On edges the panel are gold fringe. Both sides of the panel are identical. The size is 90X90 cm. Gonfalone is handed to the chief of the Headquarter, general-colonel P.Shuljak at December, 5, 2001 on the 10-th anniversary of the Ukrainain Army celebration." 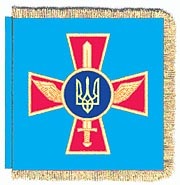 The Joint Chiefs of Staff (General Staff of the Armed Forces of Ukraine (Ukrainian: Генеральний штаб Збройних Сил України (source )) flag is seen here (it is the logo on a purple horizontal background): http://www.mil.gov.ua/content/signs/flag_GS.jpg and was established by Presidential Decree No. 705 of September 3, 2009. 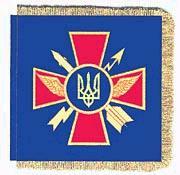 The Chief of the Joints Chief of Staff (Chief of the General Staff (Ukrainian: Начальник Генерального штабу, (source) flag is actually a gonfdalon as seen here also established by this same Decree. 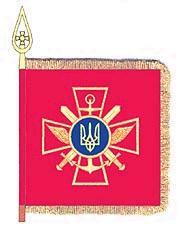 This flag of General Staff of Armed Forces (with swords, wings and anchor) and the chief's standard are based on those. The Land Forces Commander flag is actually a gonfalon as seen here established by Decree No. 705 of September 3, 2009. This Standard of the CinC of the Army (Komanduvach) is based on those. "Komanduvach" is really CinC (main army commander of Land Forces). The Air Force Commander's flag is actually a gonfalon as seen here established by Decree No. 705 of September 3, 2009. This Standard of the CinC of the Air Force is based on those.